Index and catalog your removable drives to get your files organized and categorized. Archives visited web pages with your browser to be used online and offline. Offline each page is available with its original URL. You can even use your bookmarks offline. There is no difference between surfing the internet and surfing the archive. ArtistScope Portable Media (APM) enables the distribution of most types of media by email, download or CD/USB for local viewing (while offline). Media archives can be distributed for viewing and protected by password, or DRM with access tokens. Fast CD Ripper - tool for converting your audio-CD collection to WMA 9, OGG and MP3 with ID3Tag v2 support and WAV PCM. Fast direct conversion with jitter correction feature and CDDB support combined with handy interface give you a perfect tool. Audio CD Maker will allow you to write and burn your favorite MP3,WAV,WMA,OGG songs to create customized audio CDs for your listening pleasure. Audio CD Maker Plus helps you to create normal audio CDs from your favorite audio files. The utility repairs the content of damaged optical discs for the most popular media formats: CD, DVD, Blu-Ray, etc. It quickly scans the surface of selected disc and retrieves affected data when possible. Recovery Toolbox for CD Free is freeware. A free and easy to use CD ripper software allows you to extract audio CD and convert to MP3, Wav, Ogg or Wma format.It can normalize the output files and supports additional LAME options. You can record to MP3 with your microphone. Free powerful software for ripping audio CD tracks to WMA, MP3, OGG, VQF, FLAC, APE and WAV formats files on-the-fly. Free CDDB is supported(Querying - Submiting). It supports normalization when ripping, and also support ID3 tag. Play game while ripping CD to MP3 or WAV. It's free Support MP3 and WAV creation together. Â Directly MP3 encoding, no intermediate file created. Â Â Support CDDB. Â Support normalization. GoGo MP3 To CD Burner is a software tool that helps you to create normal audio CDs from your favorite MP3, WMA, WAV, OGG, APE, VQF, MP4 files. You can then play them in your regular stereo or car CD player! Free Mp3 CD Extractor allows you to convert one or more cd audio track (cda) into standard wave or mp3 file that can be play with the audio reproduction programs. If you search for a tool that allows you to convert Cd audio tracks(cda) to mp3 or wave files you can use Mp3 Cd Extractor, it can encode cda files into mp3 and wave files. Now you can store your music on your pc with a simple click by using Mp3 Cd Extractor for free. My CD Ripper V1.0 is a simple, but robust free cd to mp3 ripper. With only a few clicks, you'll be able to save the music from your music cds as mp3 or wav files on your hard disk. Turn your Audio CD library into mp3 files with this program. This program includes the best mp3 encoder you can get. Ultimate CD/DVD Burner is a free, fast, powerful and easy to use CD DVD burner software that burns data, audios, videos, and images to CDs or DVDs. . Ultimate CD/DVD Burner is a free, fast, powerful and easy to use CD DVD burner software that burns data, audios, videos, and images to CDs or DVDs. Zg cd extractor is a free Cd to wav/mp3/ogg/ape/flac ripper. Highly customizable you can for example change the bit sample, and the sampling frequency for wav files and get stereo or mono files. Build powerful multimedia CD catalogues and brochures containing any combination of text, video, picture, sound, PPT, EXE, PDF, DOC, XLS or HTM files. Simply drag and drop files to add content and create a professional CD information resource. A simple set of files: it allows you to create an autoplay CD where you can put software or any exe. 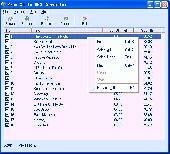 The user simply inserts the CD, then a menu window will be shown with simple buttons that show the name of any file found in the /data folder. Create autorun CD DVD menu presentation brochure catalog depliant; file collections: PDF,PPS, AutoCad.. The user inserts the autoplay/autostart CD, then a Web-like presentation is shown. Can run any file. Several protections. No complications / HTML. Free Offline Site Map Generator for Windows creates sitemaps for your website. It scans the local folder with your web site copy to collect web site pages.It generates sitemaps of the Google Sitemap Protocol XML and/or the common Site Map HTML which are recognized by all search engines, including Google. There are templates for the header and the footer of the sitemap page.